Digi-Schlock: TIMERIDER (Shout! Factory Blu-Ray) – Schlockmania! 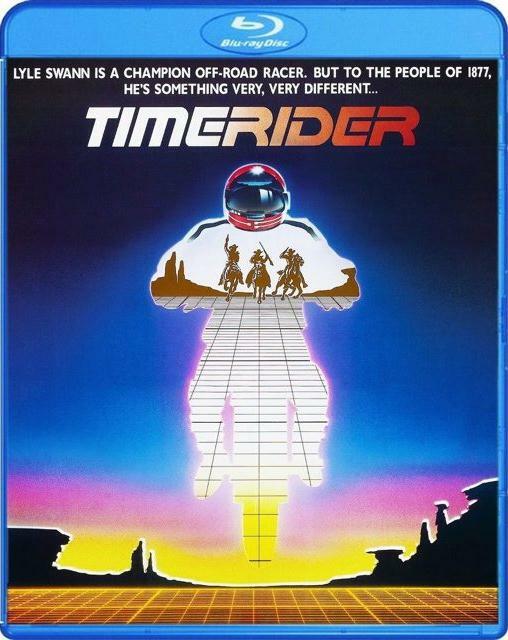 Timerider is one of those movies that many fans became acquainted with on home video – and yet, it never quite got the full and proper treatment in any format. Even the DVD that came out at the dawn of the 2000’s suffered from featuring a edited version of the finale. Thankfully for fans, Shout! Factory has picked up the film for reissue as part of its MGM properties and created its first-ever blu-ray edition – and fans of the film will like what they see. For starters, the new anamorphic transfer of the film looks great. Larry Pizer’s cinematography is one of Timerider‘s most impressive assets and this new high-definition transfer does well by the variety of colors and textures this mostly outdoor production offers. Even the “soft” style of photography favored in a lot of sequences fares well here. Fans will also be happy to note that this version restores the bit from the finale that was censored in the previous DVD release. As for audio, this disc features a True HD stereo track. It offers a solid blend of sounds and really gives a boost to the synth-heavy rock soundtrack. Shout! Factory has also included a selection of extras for fans. A commentary track with director/co-writer William Dear kicks things off and it’s an enthusiastic, informative piece of work. He dives right into his work, explaining how the film’s practical effects and unique visuals were pulled off as well as offering a wealth of info on his cast and collaborators. He’s quick to note his influences (there’s more than one nod to The Wild Bunch) and aspiring filmmakers will be interested to hear how he discusses (and frequently criticizes) his directing and editing choices from the veteran’s perspective he has acquired since this early effort. This track is well worth the time for fans and anyone who enjoys a good commentary. Also included is a retrospective featurette built on interviews with Dear and producer/co-writer Michael Nesmith. Dear repeats some material from his commentary but gets to elaborate on other tales while Nesmith offsets Dear’s comments in interesting ways (like their differing opinions over some casting choices). Nesmith is also able to offer some added perspective on how the film was financed and how he took a hands-off approach as producer to giver Dear the creative autonomy he needed. The extras are rounded by a theatrical trailer, a variety of t.v. spots and a pair of still galleries that feature a variety of on-set photos and storyboards for several sequences. The latter is a particularly interesting source of compare-and-contrast material for fans. All in all, this is another solid release from Shout! Factory, who are becoming as prolific with cult fare as Anchor Bay once was. 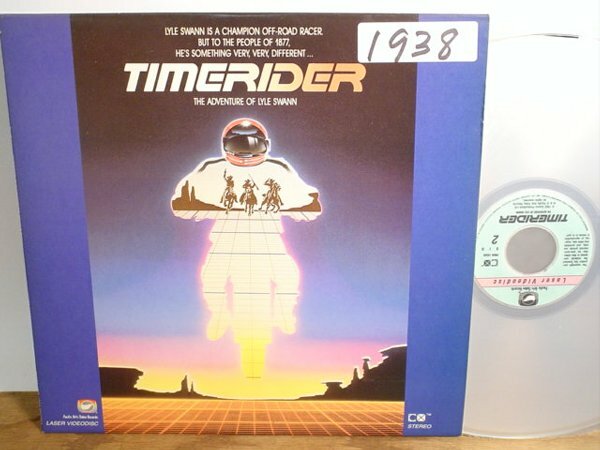 If you like Timerider, rest assured: it’s gotten the home video treatment it deserves. 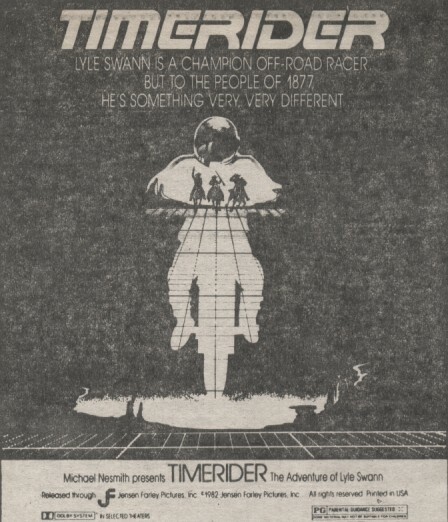 To read Schlockmania’s film review of Timerider, click here.